← Another Christmas . . .
What follows is the text of the Commencement Address given to the class of 2014 at Judah Christian School, Champaign, Illinois. These graduating Seniors were all in my Worldviews class, and I sincerely thank them for the opportunity to spend this wonderful year learning and growing together. It is a great honor and a pleasure to spend a few more moments with you, on this special day, in the company of your families, friends, and my fellow faculty of this wonderful school. We are happy to share this moment with you. Believe it or not, we are genuinely sad to see you go. But go you must. So, what do you believe? Who are you? Are you merely “an ugly bag of mostly water,” as described the silicon creatures in Star Trek proclaimed? A divine spirit or perhaps a reincarnated Thetan, desperate to be free of your physical body? Or are you, as Chesterton said, the great “exception” among all of God’s creation? Will you rise to Lewis’s challenge to be a “Man,” not a “Rabbit”? From these two Great Souls we learned about the paradox of “True Humanity”: we are created from the same material as this world, but as a creature uniquely shaped by God in his very own image and likeness. What does it mean to be “Truly Human”? You must recognize the human need to be redeemed from a fallen condition in which this image is tarnished and diminished from its original, intended glory. You must see through the illusion of human progress which promises perfection attained through our own achievements, cleverness, and good intentions. Rejoice in common grace, pursue common good through mercy and charity, but do not ever expect that paradise is ours to make. You must cultivate habits of virtue in order to live rightly in this world, looking to God’s truth, goodness, and beauty to help you transcend its limitations and avoid being of it. Williams further admonishes: “If Christians do not gain confidence and boldness and indeed joy in their pursuit of these transcendental values from thinking philosophically, then they are . . . profoundly and colossally missing the point” of who they really are. It is in the crux of this paradox that the broad philosophical question, “Who Are We?” becomes more pointed and personal: “Who Are You?” In the midst of glory and stone, who will you be? What, do you suppose, is this name that God has written on a white stone that only you know? As Wes and I pondered this question, we came to this conclusion: the name on the stone is “who you really are.” All the glory, all the likeness, all that God made and intended when He knit you together in your mother’s womb. No one knows this name but you—and God (he wrote it there!). Think about it. If someone asks “who you are,” your most likely first response would be to say your name. But is that who you really are? How many others have your name? Your parents gave you that name; they probably know you pretty well, but do they really know who you are? You have lots of friends, and they call you by that name, but do they really know who you are? In just a little while your name will be read, and you will receive a diploma with that name written on it. But is that who you really are? No, only you and God know the “essence” of who you really are. If you are like me—like most of us here, I imagine—you would be mortified if everyone here suddenly knew what you know about who you really are. But even that is not really who you are; it is an image of you tarnished and diminished by trials and temptations; by selfishness and apathy. 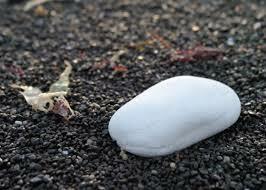 The name written by God on that white stone is the real you. It is the name of your True Humanity. God is always “Calling out your name,” but it is up to you to listen. He’s been calling since you were born, He’s calling to you now, He will call out to you always. You will always be tempted to settle for being less than who this name says you really are; perhaps you’ll be tempted to forget there even is such a name. I pray not. Whose voice will you listen to as you search for your true identity through life? The world’s? Your own? If so, then the stone you hold in your hand, which represents who you really are, will never become the “white stone” God intends for you. It will forever be transparent, reflecting whatever identity the world’s designs and your own desires make of you. But if you listen and respond faithfully to God’s call, through His Grace you will be rewarded with “fullness of life” in this world and “eternal life” beyond it. With each day’s listening and faithfulness, your name will become His Name. Stone will become glory. And one day, He promises, you will know your Name. This entry was posted in Worldviews. Bookmark the permalink.